Our compact, Universal Fence Clamps allow you to secure a variety of shop made auxiliary fences to your existing table top fences without having the clamp block your work. The clamp arm simply fits into a 3/8” hole in the top of the auxiliary fence, keeping the clamp out your way. That simply means no more cumbersome wood screws or C clamps, and no need to screw into your expensive fence! Works great for table saws, band saws, cutoff saws, router fences. Clamps come in sets of 2. When making auxiliary fences most of us have the issue of our clamps getting in the way of the cut or in our line of site. With these new fully adjustable fence clamps, that problem disappears. These clamps won't interfere with your work and they can be used on many shop made auxiliary fences. The clamp pin will fit into a 3/8" hole drilled into your auxiliary fence. Note: Your fence should be at least 3/4" thick to ensure that there is enough clearance for the 3/8" hole. When fully extended the clamp measures approximately 5-3/4" in clamp capacity, which means it will fit almost any size tablesaw fence. 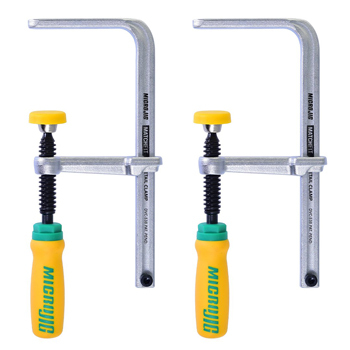 With these clamps you won't have to worry about using those cumbersome C-clamps or wood screw clamps. More importantly you don't have to drill screw holes into your expensive fence(s). The Adjustable Fence Clamps work great on tablesaw fences, router fences, re-saw fences for the bandsaw, and more. You can also use the clamps individually with a block of wood for a stop block. 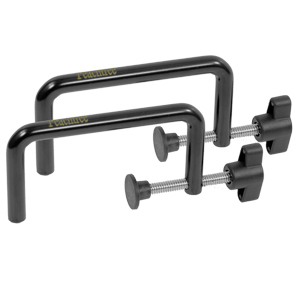 Each package comes with a set of two fully Adjustable Fence Clamps. MATCHFIT Dovetail Clamps – the only clamps as free as your creativity. The breakthrough dovetail clamp arm design gives you the freedom to create your own track grooves using a dovetail router bit to clamp virtually anywhere. Create clamping tracks virtually anywhere by routing dovetail grooves. Use with Matchfit Dado Stop (sold seperately) to create perfect-fitting dados, joinery, and inlays with any saw blade, fast. Designed for creativity, engineered to work smarter. 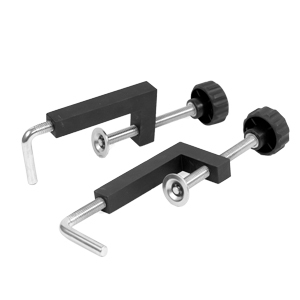 Includes: 2 MATCHFIT Dovetail Clamps. Note: Routers, tablesaws, Matchfit Dado, bandsaw fences, K5, jigs, templates and all accessories are Not included. Perfectly-fitted dados, joinery, and inlays without measuring, marking, or test cuts. 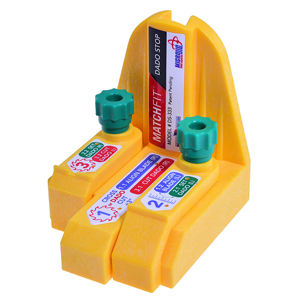 Simple and easy to use, the MATCHFIT Dado Stop sets the shoulders of your cross dado using the actual part that will be fitted in the dado for a perfect fit without measuring or test cuts. No hassles, no tricky measurements, just perfect-fitting dado cuts. It's simple, Using the legs as a stop, make your start and finish shoulder cuts. 1. Use Leg #1 to cut your first shoulder. 2. Use Leg #3 to cut your second shoulder. 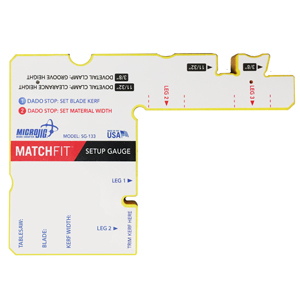 The MATCHFIT Setup Gauge is used for setting up Microjigs® MATCHFIT Dado Stop. The Setup Gauge will allow you to setup for both the left and right side of your table saw blade kerf without having to set up the Matchfit Dado every single time. By Cutting the blade kerf into the gauge it eliminates the steps of having to set the kerfs thickness on the dado stop. MICROJIG's exclusive MATCHFIT Dovetail Router Bit makes the MATCHFIT system faster and easier to use than ever before. 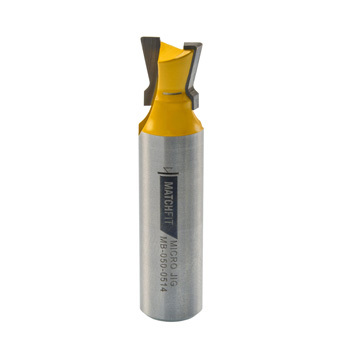 The MATCHFIT Dovetail Router Bit is designed especially for the MATCHFIT Dovetail Clamps and dovetail hardware. Although it mills the same 14 degree, 1/2" profile as a standard dovetail bit, its unique design automatically rounds over the sharp top shoulders creating incredibly clean dovetail grooves and virtually eliminating the need for sanding. Experience the difference supreme engineering and attention to detail make. Evacuate chips and dust, reducing friction, and heat, resulting in cleaner cuts.